Don’t know what to do with an old unwanted car? 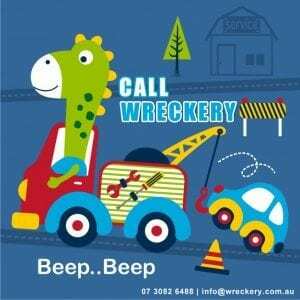 Contact Wreckery – the best car wreckers Brisbane! Sell your unwanted vehicle for top dollar. Also, we buy all sorts of vehicle irrespective of the make, the model and year of manufacturing. Get rid of your junk car without any hassle. We buy cars that are junk, scrap, damaged or even wrecked. All you need to do is call us today and get your car towed away for free! You can experience the simplest & fastest form of removal service with our expert auto breakers in Queensland. Just follow the procedure given below and sell your car to us in a hassle-free manner. Call us on our office number or email us with full details of your vehicle. Our wrecking expert will give you the most precise value of your car based on the details you provide us. If you agree on the price and want to proceed further, our professionals will be at your place to serve you. A full analysis of your car will perform to find out the best possible payable amount. With your approval, some papers will be signed by you for the legal procedure. We will also pay you money on the spot. The vehicle will be towed instantly by our drivers from your yard. When you are searching for Car Wreckers, you should keep below points in mind before finalizing on any salvage yard in Brisbane. Years of experience – More years of experience a junkyard has, more knowledgeable and resourceful they are. Making it easy for you to gather information, know their way of working and of course the reputation in the market. Authorization – Always opt for a wrecker’s yard who has all the necessary license, authorization, and has all the required paperwork in order. That will guarantee that your car dealing will be legal and that your vehicle will not end up in some harmful activities at a later stage. Reputation – A service with a good reputation is always a better choice. Reputation vouches for sincerity, hard work, customer focus and expertise in the field. When you put all this together, you will get a customer-friendly, transparent process and a right wrecking yard for your unwanted motor vehicle and you will know that their prices will be genuine. So, chose-wisely when you are looking to earn cash for junk cars or Cash For 4×4. We find out the value as per its condition, make & model of the cars in Brisbane. Besides our free services, our team also make sure that you will obtain the best possible prices for your scrap vehicle. After evaluating all the terms & factors, we will quote you a price in no time. Moreover, you can sell any type of motor vehicle to us and earn up to $12,999 from damaged, unwanted vehicles and around $29,999 for unwanted trucks. Car Dismantlers Brisbane north buy your scrap cars to resell further or recycle them. The auto wrecking process involves reusing or recycling the damaged spare parts, and we salvage cars Brisbane the auto parts beyond repair. First of all a wrecking yard, junkyard or scrap yard Brisbane is the location of a business in dismantling. Where decommissioned or wrecked vehicles will buy. So, their usable parts use in running cars. Instead of wasting the useful resource, we put them into their right uses. Wreckery Car Dismantlers Brisbane a brand name that most Aussies are familiar. While the unusable metal parts, known as scrap metal parts, are finally sold to metal-recycling companies. Other terms include wreck yard, salvage yard, breakers yard, wrecker’s yard, scrapheap, and dismantlers. Furthermore, In Australia, they are also referred to as ‘Wreckers,’ ‘Auto Wreckers‘, and ‘Car Breakers.’ Above all, Auto wreckers usually conduct the wrecking process in their salvage or wreckers yard. The auto wrecking process comprises three steps. The first step – entails removing all the liquid such as petrol, coolant, gas, and parts such as batteries and engine. After removing these dangerous parts, the vehicle is ready for dismantling. The second step – includes the dismantling of the vehicle. The reusable parts are further sold or recycled. The last step – They compress the unusable parts from the vehicle for recycling the metal. Accordingly, This process increases environmental conservation by eliminating hazardous liquid and metal waste from unwanted cars. Therefore, whenever you get stuck with a damaged vehicle, sell cars to wrecker Brisbane and earn good cash besides aiding in conservation of nature. Getting top dollar for a car that is not even operational has never been so easy. We buy any vehicle in any condition and offer highest wrecking prices up to $12,999. Hence, Our tow truck will come to your place and also provide free car removal and paperwork necessary to complete the deal. 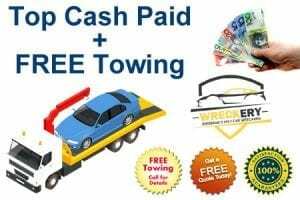 When you sell a wrecked vehicle to the professional auto wreckers Brisbane, in addition to getting free services you also get paid big and instant cash. 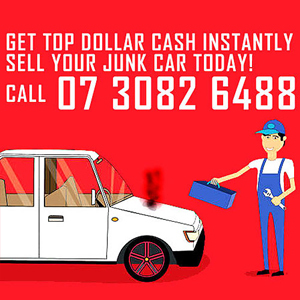 We professionally manage cash for cars disposal company in Brisbane. We pay top cash on the spot for all types of vehicles irrespective of the model and the condition. Our company also has the necessary authorization, licenses, and equipment to conduct the business legally and safely. We have a customer-centric approach making us a favourite amongst our clients. We provide value-added services to minimize the time and hassle to the vehicle owner. So don’t hold onto wrecked vehicles, call wreckery Auto Dismantlers because we provide stress-free service. Wreckery has changed the behaviour and nature of the wrecking industry. With professional male and female staff. We also make auto parts industry as lively as possible. Providing a competitive price is a small picture of Wreckery. All our highly trained telephone staff because of the training offered on a monthly bases. They are also able to understand every nut and bolt of a Vehicle. What Brands do we wreck? First of all, we have widened our area of dealing. Now, our customers also have the opportunity to sell us any make and model of the automotive. Our auto wrecking experts will visit your place to remove the auto irrespective of your location in Brisbane and its surrounding areas. Therefore we serve the entire Brisbane and its nearby suburbs like Edens Landing, Holmview, Pimpama, and more. We purchase vehicles like vans, utes, trucks, 4wds. Similarly, some of the popular brands of cars that you can sell us are Toyota vehicles, Isuzu, Holden, Mazda, Nissan, Mitsubishi, etc. Above all our technical teams have lots of experience and knowledge in this field of work. So this is what enables us to provide a safe and hassle-free service. So our heavy-duty vehicles are efficient to remove any type of vehicle irrespective of its size and weight. What Do We Do With The Removed Automobiles? The automobiles that we remove from our client’s yard are sent for automobiles recycling. Also, we make sure that the entire process is accomplished in an eco-friendly way. Hence this is what makes Queensland Auto Recyclers the best-wrecked car buyers in BNE. Our professional auto dismantlers handle the wrecked cars. So they analyze the vehicle to find out the useful parts. The valuable vehicle parts are removed and sold for reuse. The rest of the metallic auto parts will sell to a metal recycling company for making further appliances. So, it doesn’t matter whether your motorcar is working or not; you can still sell it to us. Quality New/Used Car Parts at Lowest Ever Prices in Brisbane. Are you tired of regular motorcar repairs? Since we buy cars of all brands and models, we have the right solution for you! Buy second hand and good quality auto spare parts from us. We offer you used auto parts for your vehicle at the best prices! Instead of shelling out money on new auto parts, call us. We also provide you with good quality auto parts Toyota car, Mazda, Hyundai, BMW and more at low prices. Many well-known motor wreckers Brisbane will also offer warranties on the used auto parts. Do not randomly look for nearest QLD wreckers Brisbane because we have great deals for you. Finally, call us today for great offers and warranties on used motorcar parts and truck parts. Moreover, we offer certainly 90 days warranty on the parts. At Wreckery, we also offer free vehicle collection of unwanted cars, trucks, vans, and trailers. So, Truck Wreckers QLD will tow your vehicle straight from your garage. Instead of asking for heavy towing charges we provide free services. So, call us and earn cash on the spot for wrecked vehicles without incurring any cost. To know more about Wrecking yard on Wiki.